It seems that the staff at a local art supply store have noticed that I like pencils. I learned that some old pencils had been found by the mother of one of the staffers, and it was thought that I would be an appropriate recipient. I was quite amazed. The pencils are yellow, with a gold/white ferrule, and pink eraser. The type style is a classic mid-century industrial look, and is often emulated today. 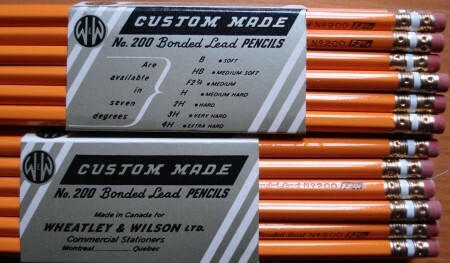 I can’t easily find any information about Wheatley & Wilson, although the McGill University Library reveals that Montreal does have a 1930 building with that company name, the Desbarats’ Building (The Gazette)/Wheatley & Wilson Ltd.
From the language on the packaging, it seems possible that Wheatley & Wilson had these pencils made for their stationery business. I’d love to know more about them. Is there anyone out there who recollects this name? I sharpened one. It still has a nice “pencil” aroma. The lead is quite smooth for an F grade, and writes quite easily. A classic. Hi Pat, thanks for the comment. I understand that Rosseau is a very beautiful community. I’m afraid I don’t know the age of the pencil. Probably someone in Montreal may know the dates when Wheatley & Wilson were in business. I saw your posting on the Wheatly and Wilson pencils and thought I would give you some information. The pencils date back to the 70’s. Wheatley and Wilson were the largest English stationers in Montreal. They were sold to Wilson Stationers, part of Molson’s around 1978. My father worked for them from the early 1950”s and moved over to Wison’s . Although the pencils were inscribed as made in Canada, I seem to remember my Father going to the harbor in Montreal to take delivery of the first shipment. Hope this answers your question. That’s a great answer, Brian, and nice to hear a little more history on them! Thanks for sharing that. Mr. Wheatley was from the U.S. – I believe Chicago – so it is likely that much of their product came from the states.